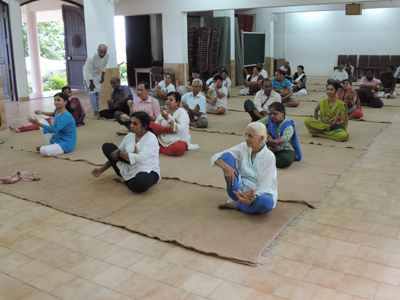 On the occasion of International Yoga Day on 21 June, 2017, Sri Aurobindo Society organized a two-hour long session on yoga asanas which was attended by more than 15 yoga enthusiasts. Kiran, resource facilitator at Sri Aurobindo Society, Puducherry, a practitioner in the field of Integral Education and Yoga Shiromani, conducted the session which was both educative and highly beneficial. Kiran started the programme with yoga pranam to all the Yoga Gurus. This was followed by a short talk on the usefulness by Gayatri, writer and content editor in the Society’s Research Section. She shared some excerpts from the chapter on ‘Hathayoga’ in The Synthesis of Yoga by Sri Aurobindo. Gayatri also spoke about the advantages of yoga and shared some facts based on recent research done on the subject. She said research shows that apart from reducing pain in joints, back, arthritis, migraines, muscle soreness and other health improvements, yoga also increases the levels of the brain chemicals like GABA, serotonin and dopamine, the happy chemicals responsible for feelings of relaxation and contentment. 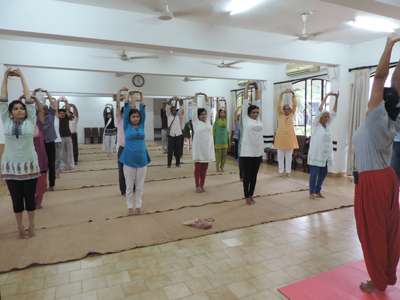 All the participants enthusiastically followed Kiran who demonstrated several yoga asanas and pranayamas. She explained in detail the beneficial aspects of the standing, sitting and supine postures. Some asanas, Kiran added, can be easily done even while sitting at your workstation or at home. Another programme was organized at our Society premises in the Sultanpur branch in which Shri S.B. Singh (MLA, Sultanpur) was the chief guest and it was presided over by Shri Sitaram Verma (MLA, Jaisingpur). Dr. J.P. Singh, the chief orator, highlighted the ‘The Four Aids of Yoga’, while senior physician, Dr. Ashish Srivastava delivered a lecture explaining the scientific basis of pranayama. This event was well attended by over 200 people. Meanwhile earlier on June 20, 2017 a lecture was organized on ‘Integral Yoga in Practical Life’ in Y N Academy, Dannupatti, Sultanpur. Dr. J.P. Singh was the chief orator, local MLA, Shri Sitaram Verma, the chief guest and Prof. C.M. Pandey (HOD, Biostatistics and Teleinformatics , SGPGI, Lucknow ) presided over the event which was attended by around 200 people.